Here is the Circus logo as well as 2 web design flats that I created for my Advanced Special Topics in Advertising course in Spring '09. 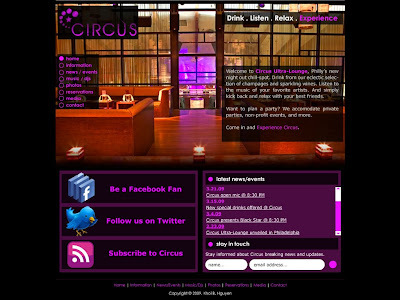 For the assignment we were to design a logo along with 2 web flats for Circus (a made-up restaurant our class decided on). For the logo, I wanted it to be modern & stylish, with the theme of circles, and the star which represents Circus. 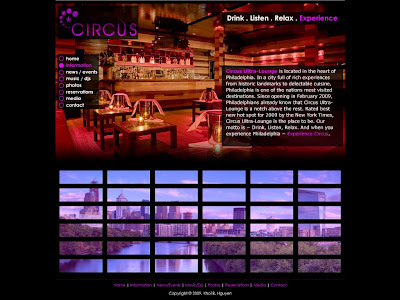 For the web flats I decided to make Circus a new ultra-lounge and best chill-spot in Philadelphia. I thought a news feed would be a good idea to implement for a lounge. And I also implemented Facebook and Twitter links on the homepage seeing how these 2 social networking sites have gained such popularity in today's culture of young and old alike.